Killer Characters: Hilary Stone here . . .
Hilary Stone here . . .
I’m sure you’ve heard of me. I’m quite famous now, you know. Ever since I published my first mystery – Murder Comes Calling. Quite frankly, I never expected the reception my book has received. It’s been on the bestseller lists for weeks now and I’m quite thrilled about that! Of course, my husband is Derek Stone of Lexington Avenue Publishing, and that has definitely been an asset in getting published. Rebecca Mayfield was lost in thought as she sat on the subway bench waiting for her train to arrive. The murderer had targeted women alone at night, in dark alleys and city streets. Each victim had complained of mysterious phone calls for three consecutive days before their deaths. All young women were in the prime of their lives. What sort of monster would violate the innocent? she thought. She knew she was on to something, but her editor had threatened to pull the story unless she came up with something solid, something the police hadn’t yet discovered. The bench began to vibrate beneath her. She heard the roar of the incoming train. Gathering her purse, she stood and approached the edge of the platform. She glanced down. Her heart almost stopped. On the tracks below lay another victim of the killer, a thin plastic cord wrapped around her neck. Rebecca’s screams were drowned by the roaring sound. She couldn’t possibly halt the train in time. She covered her eyes as the brakes began to squeal. I’ll bet you’re wondering what in heaven’s name I’m doing in Snowflake, Vermont. Well . . . it’s a bit of a secret, so I can’t be entirely open about my reasons for being here. The story I’m telling everyone is that I needed to find a place that would be quiet and private while I work on my next book. The village of Snowflake is far enough off the beaten path that I felt it would be perfect for me. Now, I’ll give you a hint of the real reason, although you mustn’t repeat it. My former husband lives here. Can you believe that? He retired and slunk off to the woods. Hmph! Doesn’t surprise me a bit. He always was an impossible introvert and a loner. I, on the other hand, have always loved the hustle and bustle of New York and the social whirl. You can see why we weren’t very compatible. I will have to contact him while I’m here. He was never immune to my charms, and I’m sure that no matter how much time has elapsed, I can still win him over. Oh, and before I forget, I’m having a book signing in the village and fans will be coming from miles around for a copy of Murder Comes Calling, not to mention my autograph. I hope I’ll see you there! You can read all about my story and what happens to me in A Clue in the Stew. 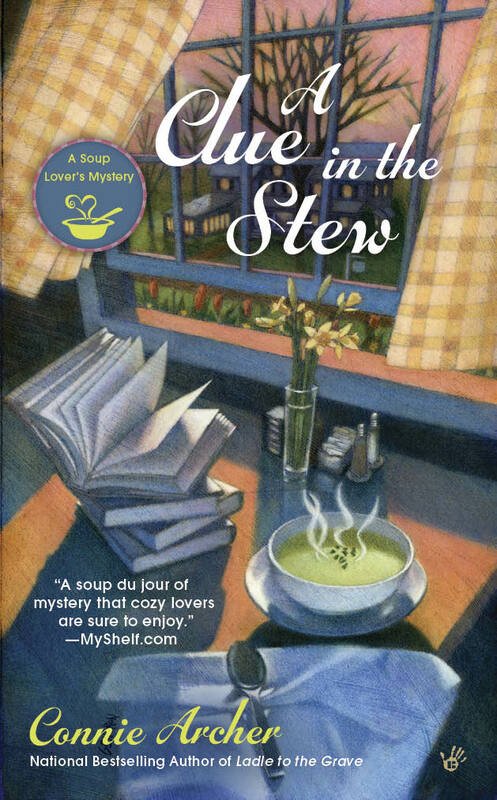 This month my author, Connie Archer, is giving away one of the Soup Lover’s Mysteries – A Spoonful of Murder, A Broth of Betrayal, A Roux of Revenge, Ladle to the Grave or A Clue in the Stew. 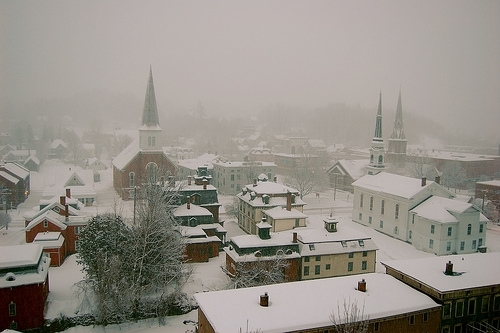 If you’ve missed any of this series, now’s your chance to catch up on the stories in Snowflake, Vermont. 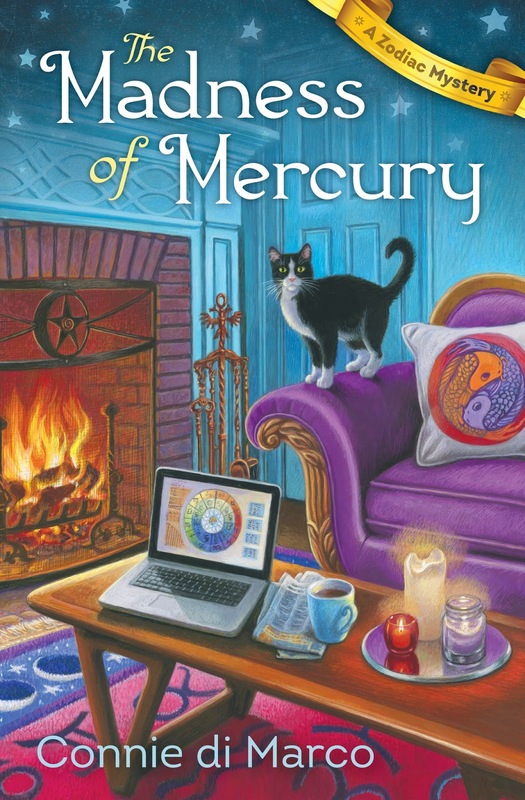 And in case you’ve read them all, Connie’s alter ego, Connie di Marco, will offer the first book in the Zodiac Mysteries – The Madness of Mercury! This giveaway will run from December 15th and end at midnight on December 16th. That’s 48 hours and all you have to do to win is leave a comment. Happy holidays everyone! You can visit Connie Archer at her website, Facebook or Twitter @SnowflakeVermont. And you can learn more about the Zodiac Mysteries at Connie di Marco's website, Facebook or Twitter @askzodia. This series sounds wonderful, new to me! Thanks for the chance. H Karen, glad you could visit today! You were up late last night, right? Best of luck in the giveaway! Wow this sounds really good...and has a lot of suspense from the review..thank you for the contest. Hi Marilyn - Great to see you here today! Hilary has a very interesting story. I think you'd enjoy it. Best of luck! I hope you'll get to enjoy all the stories in Snowflake soon! Good luck in the giveaway! Hi Dianne - Thanks for visiting today! I'll add your name for the first Zodiac mystery. Very best of luck! What a lovely post. I loved it. Made me smile. Thanks for the chance. Thanks, Debby, glad you could stop by today! Hope you'll be reading this latest story in Snowflake soon. Good luck! Thanks for the opportunity to win a book from this wonderful series! Oh you're very welcome! All the best in the giveaway today! Hi Melissa - Thank you! So good to hear you've enjoyed the stories at the By the Spoonful soup shop. Hope you'll be meeting Julia in San Francisco soon. Good luck! I like the soup mysteries. Hi Sandy - Best of luck in our holiday giveaways! And happy reading! Hi Sharon - Thanks for stopping by today! Best of luck in the giveaway! Thank you and thanks for visiting today! Best of luck in our giveaways and happy reading too! Thanks for the giveaway to this great series, looking forward to the new Zodiac Mysteries as well. Janet-monstercreed1@yahoo.com. Hi Janet - I hope you'll be enjoying Julia's adventures and mysteries in San Francisco soon! Good luck today! Hi Daniele - Thanks for stopping by today! Good luck in our holiday giveaways! I love this series. I want to try the Zodiac series next. Hi Annette - thank you! And Lucky and Jack thank you too. I think you'd really enjoy Julia's adventures in San Francisco as well. Best of luck! Love this series but I haven't read them all. Hi Connie - Good luck in the giveaway. Hopefully you'll be able to catch up now. Happy reading! Oh, thank you, Katie! So glad you've enjoyed them. Best of luck in the giveaways! A discovery like that on the subway platform would really ruin one's day! I'll say! Fortunately, it's only fiction (within fiction), Libby! Happy reading! Hi Dianne ~ thanks for visiting today! Great to see you here. Good luck and I hope you'll be back in Snowflake soon! Hi Donamae ~ Hope you have lots of interesting reading over the holidays! Good luck! I have three of the soup mysteries. Cold here in Ohio, maybe 13 degrees. Soup would be a good idea. Hi Michelle ~ Absolutely! There's nothing like soup in freezing weather! Best of luck! Hi Mary ~ I hope you'll get to enjoy the adventures in Snowflake, Vermont very soon! Good luck in the giveaway! Hi Kristina ~ Have a great holiday and happy reading! Best of luck! Hi Tonya ~ thanks for visiting today! Good luck in the giveaway! Happy Holidays. It's cold and blustery here, we're supposed to only be in single digits tomorrow. I could go for some soup. Thanks for the opportunity! Hi Kathy ~ Great to hear from you. Brrrrr, soup is just the thing. You can send some snow my way for a White Christmas! Happy reading! Hi Jana ~ It's cold and snowing there right now! Wish I were at the soup shop! Best of luck in the giveaway! I recently read The Madness of Mercury and loved it. When will the next one of that series be published? Hi Sue ~ Thank you! I'm so glad you enjoyed the first Zodiac mystery! The next one will be out on August 8th (2017) Kind of a long wait, I know. It's called All Signs Point to Murder and it's up on Amazon already. Best of luck in the giveaway and great to hear from you! Oh, thank you so much, Cynthia! That's so kind of you to say. Very best of luck and happy reading over the holidays and the New Year too! I have read the first three in the series and have the fourth one but am saving it for a rainy day. (Some books you just have to save for special times!) So I would be interested in winning A Clue In The Stew. Thanks for the chance! Hi Elaine ~ what's better than snuggling up with a good book on a rainy (or snowy) day? Very best of luck in the giveaway and thanks for visiting today! Hi Della ~ I hope you'll be visiting Snowflake, Vermont very soon! Or perhaps sharing Julia's adventures in San Francisco in the Zodiac mysteries. Very best of luck! Hi Linda ~ Thanks for stopping by today! Very best of luck in the giveaway! Hi Debbie - best of luck in the giveaway! The Soup Lover's Mysteries are almost like a real trip to Vermont. I hope you'll be visiting the village soon! Hi Sharon - Thanks for stopping by today! Good luck in the giveaway! Hi Pam - I hope you'll be able to visit the village very soon. Best of luck! Thank you for a marvelous post about a very fun book...I'm very interested in getting into this series. Fingers crossed! Hi Kathleen - Thanks for visiting! And best of luck in the giveaway! Hi Georgia - Glad you could stop by today. Good luck in the giveaway! I've never read either of these series. Thanks so much for the chance to win!!! Hi Abby - thanks for entering and I hope you get to enjoy either of these series soon! Getting ready this morning to pick a winner. Stay tuned! Hi Lisa - Great to see you here! And best of luck! HimMary - So glad you could visit! Good luck in the giveaways! Hi Maureen - It's so nice to connect with a new reader! And all the books in the series offer several recipes. I love soup too! Best of luck! Hi Robin - So glad you could visit! I think you'd enjoy Julia's adventures in San Francisco in the Zodiac Mysteries too. Best of luck! Hi Margo - Thank you! And thanks for stopping by! Lots of luck in our holiday giveaway! Hi Marilyn - Lots of luck today and happy reading! Hi Doward - How nice to see you here! I know you're an avid reader! Best of luck in our giveaways! oh my! i hope i've not missed this!!! Hi Sheryl - No worries, you're entered. I'm just about to plug the numbers into random.org and pick a winner. Stay tuned and good luck! Thanks to everyone who entered my giveaway the past two days! I've used random.org to be fair to all, and the winner is Karen Kenyon. This is the first time ever that the first person to enter has won! Karen if you're out there listening, I'll contact you offline. And with luck, I'll be able to figure out how to add you to the winner's list at Killer Characters.